The Golden Ticket for the longest Bowie concert,,, ever! Feast your mind on that three and a half hour set list! That’s not a concert; that’s a boxed set! Main set in black. Encore #1 in red. Encore #2 in blue. It opened with an acoustic version of the one song that was immediately appealing from “Earthling” and went straight into a “Hunky Dory” deep cut before covering The Velvet Underground and pulling a “Low” deep cut out of their hat as if by magic. The immediate effect was to prepare one for anything and everything, which, is exactly how it played out by evening’s end. Only “Fame” and “Fashion” were from the “Sound + Vision” tour setlist. The rest was shot through with a sense of both history and adventure as Bowie’s four piece band tackled deep cuts and modern material with aplomb. Better still, nothing from the “double-breasted dumbness of the mid-80s*” was within miles of the stage that night. Next: …What do you do the night after you were in a room with David Bowie’s band? 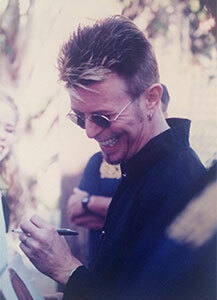 This entry was posted in Bowie, Concert Review, Core Collection and tagged 1997, David Bowie, Earthling, Organ Auction Live Event. Bookmark the permalink. It’s pretty well known that you got the Brilliant Set. In NYC at The Supper Club, which I almost DIDN’T get into, we got just under 25 tracks but we did his version of O Superman which was, um, unexpected – and wonderful. I think he stripped away a few songs from the set list and the encore list by the time they got to NYC. Echorich – Well, it certainly made up for never having him tour in Florida. 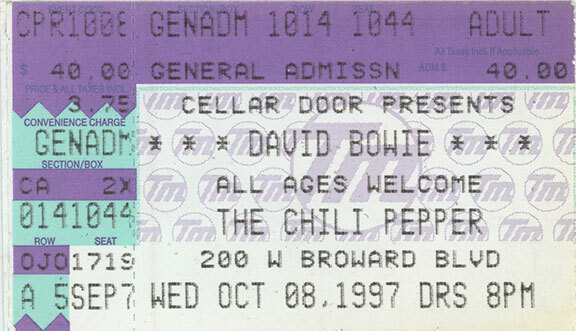 If you read the link to the other blog, the fellow who wrote that was apparently a writer for Jam Magazine’s South Florida edition, and he was taking notes which had Bowie threatening to perform his longest show ever. I was too busy gawking at Bowie [and Gabrels and Garson, who was having a great time himself] who were about 25-30 ft. in front of me. 25 tracks is still nothing to sneeze at, mind ye. Wow…had to read that setlist out to my wife. Her fandom came late and after she passed on a spare ticket for a show on the Reality tour that became spare after a friend broke his arm, while…arm wrestling, seriously! To say she regrets that would be a gross understatement. The setlist for that gig was pretty great but not as long as this! I managed to get something like 12th row tickets in a 10000 capacity venue which made a big difference. £75 pounds on eBay at the time, ridiculous bargain with hindsight. But to imagine a gig in a 1000 capacity venue…amazing. 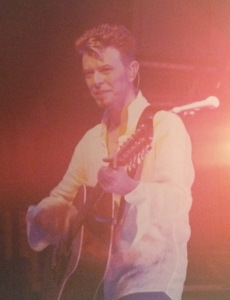 Bowie did some small gigs in the UK that year but for various reasons I wasn’t in a position to get to them. Again it was just before his transition from legend to, the horribly over used term, icon. Meaning that any future gigs would be sold out in 2 seconds to organised touts!